The total out-of-pocket cost of attendance is compared to instructional expenses, an incomplete look at how much a college spends on a particular student. I don’t have a problem with the measure used of the total out-of-pocket cost of attendance—the net price posted for someone at the 20th percentile of family income. 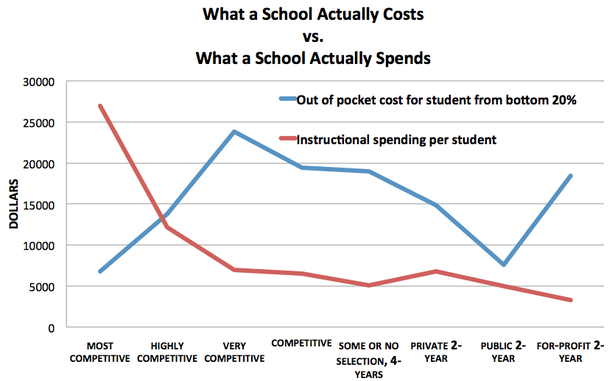 But instructional expenses are but a portion of per-student expenditures. The cost of providing room and board to on-campus students is an important part of the expenditure equation, but one can certainly argue that it isn’t directly tied to education. So I will focus on a broader category of educational expenditures, which include expenditures for academic support and student services as well as instruction. Instructional expenditures (which Hoxby and Avery report and Thompson uses in his chart) include the costs of teaching courses, but do not include the costs of closely related enterprises that enhance the classroom experience and even make it possible. In the 2009-10 academic year, the average four-year university in the Washington Monthly college rankings spent $8,728 per full-time equivalent student. Academic support expenditures help to keep the university operating and include essential functions such as advising, course development, and libraries, as well as some administrative costs. The average academic support expenditure per student was $6,832 per FTE—nearly as much as direct instructional expenses. Student service expenditures include financial aid, admissions, and social development in addition to some spending on athletics and transportation. Average expenditures in this category were $2,981 per FTE in 2009-10, although truly necessary expenses may be somewhat lower. Combining these three categories, the average educational expenditure per full-time equivalent student was $18,542 in 2009-10, more than twice the cost of instructional expenditures and very similar to the out-of-pocket cost for students from lower-income families. In that light (and after accounting for the cost of room and board), these students are receiving at least a modest subsidy. Hoxby and Avery should add as a caveat that there are other factors that go into educational expenditures besides the cost of teaching classes. This would help the education press not leap to such hasty conclusions that do not pass a smell test.